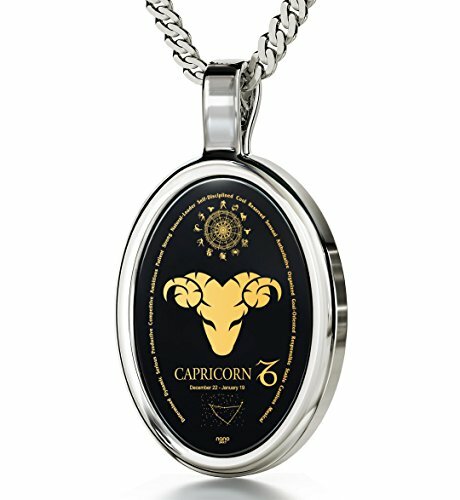 This unique Capricorn necklace is imprinted in 24k gold with the zodiac sign, captivated by images of your constellation charted in the heaven and the zodiac. This enchanting oval onyx stone, 0.6x0.8 inches, 15x21mm, is finalized with the personality traits associated with the star sign and elegantly rests below the graceful lines of the 925 sterling silver or 14k gold filled chain, 18", 45cm. The necklace is set in a decorative 925 sterling silver, gold plated, 14k white gold or 14k yellow gold setting of your choice. Celebrate your month of birth or give that special someone the perfect gift of a zodiac necklace to accent their unique elements. Capricorn pendant necklace with the mountain sea goat star sign, symbol, constellation and personality traits intricately inscribed in 24k gold onto an oval onyx stone, 0.6x0.9 inches, set in a 14k white gold cameo style frame measuring 0.65x1.15 inches, including the bail. The tenth astrological sign in the zodiac chart, Capricorn falls between the dates and months, 22nd December and 19th January. Celebrate your individuality or give this jewelry as a perfect surprise present for astrology lovers.